Can Hong Kong match Singapore’s “Walkability” Initiatives? Sounds like a tune you’ve hummed to before? For quite some time, the indefatigable theme bleated cheerily out of every TV speaker in Hong Kong, urging its audiences to join in the Healthy 8,000 Steps Campaign and embrace a lifestyle that involves lots of commuting on foot. On average, 8,000 steps require walking at least 6 km – an excellent target to shoot for that would not only improve public health, but when multiplied by the thousands, effectively ‘walk down,’ or drastically reduce the effects of carbon emission that is the legacy of vehicular transportation. The question, of course, is just how easy or comfortable is it to walk in Hong Kong? Whether it be treading an extra distance en route to work, or taking a leisurely stroll by the harbourside, just how “walkable” is Hong Kong as a city? With its vehicle-oriented road designs, high roadside pollution and generally poor signage, urban Hong Kong isn’t exactly “user friendly” when it comes to walkability. 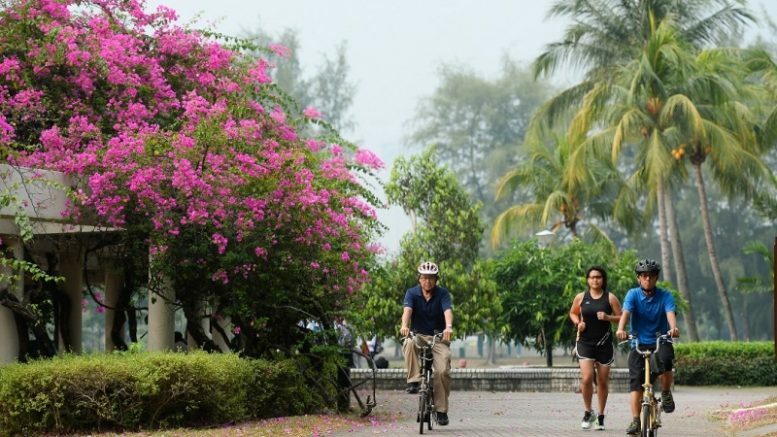 Singapore, on the other hand, has raced to make improvements in accessibility to amenities, connectivity and ease of access to and through pedestrian routes, both intra- and inter-town. 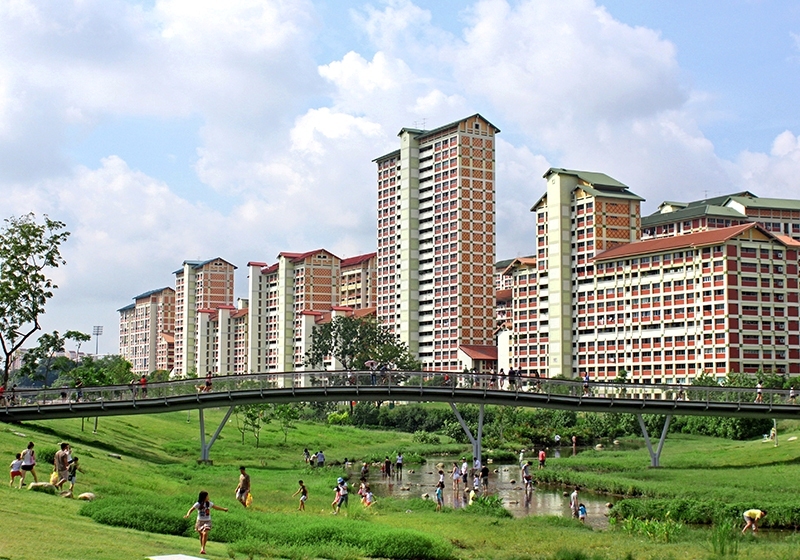 Singapore’s expansion of the Park Connector Network comes with the latest installation of the Central Urban Loop, a 36-kilometre linear walk and cycle space that links iconic public housing estates in the central region of Singapore with major natural sites and parks, enabling Singaporeans to park hop their way to leisure and work more easily. Residents can also enjoy the ocean of greenery proliferating throughout the city in a garden initiative. This project was begun over 50 years ago by the then Prime Minister Lee Kuan Yew, who symbolically planted a Mempat tree that has since ignited the greening campaign. Lee’s green vision for Singapore, in which well-designed open space for walking constitutes a vital part, is further reflected in the pedestrian-first road-use planning employed by his son and successor, Prime Minister Lee Hsien Loong. Ang Mo Kio, one of the most established new towns in Singapore, is set for a pilot makeover to become a model “walking and cycling” town in 2018. The first phase of the plan is already complete, granting residents use of two stretches of designated cycling paths, with a further 4km loop to open in July. This goes hand in hand with the instalment of pedestrian priority precincts, traffic junctions enhanced with safety features, and map boards – all designed with the principle of putting pedestrian-first firmly in mind. 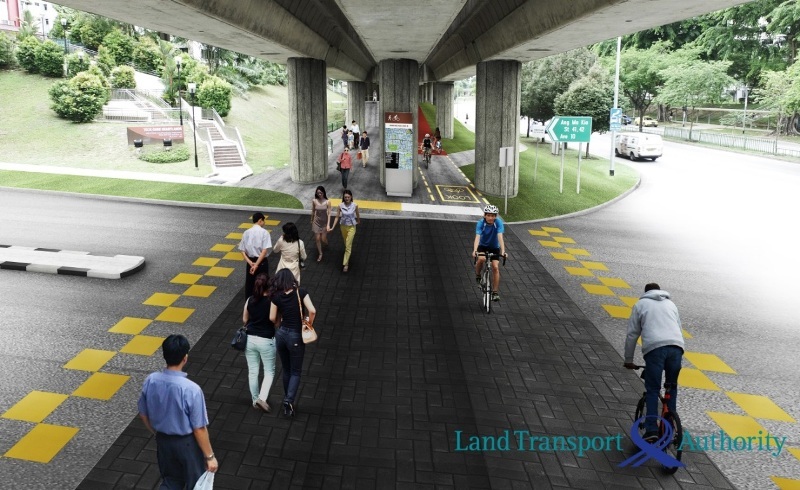 The plan to diversify road-users does not stop here: soon other towns will pursue Ang Mo Kio’s path under the multilateral cooperation of the Urban Redevelopment Authority, the Land Transport Authority, the National Parks Board and the Housing Department Board. While Hong Kong has not exactly paid mere lip service to the promotion of more walking – its footbridges and escalators some of the most interconnected in the world, linking Central Business Districts (CBDs) with transportation hubs, cultural zones and tourist destinations – the problem is just that: pedestrians are not put first, and are often excluded in favor of vehicle-users at the urban planning level. The monopolization of cars as the major road users does not just ‘dissuade walking’; It is more than that: it alienates the actual people from having a sense of genuine belonging to the streets, hence the imagery of CBDs as some sort of triple-layered, segregationist sieve where only those who can afford to own a car get to commute on the ground level freely, the rest are either pushed underground to the MTR, or propelled into the midair to walk the sky-bridges. Civic Exchange, an independent non-partisan, Hong Kong-based public policy think tank, believes Hong Kong can take a page out of Singapore’s book to develop a new and comprehensive transport development strategy, which incorporates elements of walking, cycling and efficient public transportation interchange. This will require not only closer cooperation between policy bureaus and public transport operators, but a clear vision, ambitious targets and solid determination to overhaul the mentality of roads as vessels of vehicles per se. This is the third of a series of articles by Civic Exchange, an independent think-tank, in its joint programme with Walk21 for the Walk21 Hong Kong Conference scheduled for October 3 to 7, 2016. You may visit www.walk21hk.com for more details and registration. Join the discussion with Civic Exchange and a host of world-renowned scholars, experts, civil society groups and officials at Walk21 Hong Kong on 3-7 October 2016 at the Convention and Exhibition Centre in Wan Chai. Learn what world-class cities are doing in the realm of “people first” planning. Already held in 16 cities around the world since 2000, this is the first Walk21 to be held in Asia. Early bird discount pricing ends 30 June. Be the first to comment on "Can Hong Kong match Singapore’s “Walkability” Initiatives?"